Dubai, UAE, June 19, 2017: The first series of Health and Wellness was held at Skyline University College on May 24, 2017. 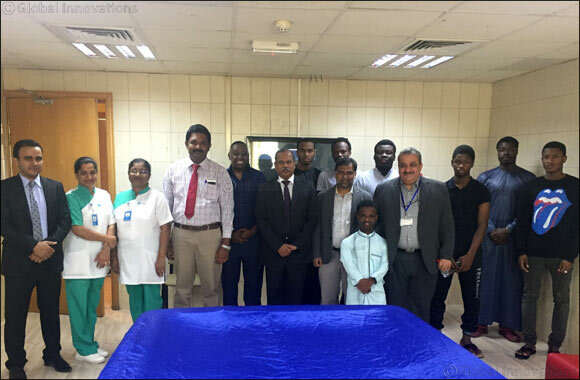 The event was designed to sensitize the students on emerging health concerns through lectures, discussion and medical check-up among the students, staff and faculty. Medical Practitioners from NMC, Sharjah and Dr. Sunny Medical moderated and sponsored the inaugural event. The event highlighted and focused on non-communicable diseases (NCDs) mainly cardiovascular diseases, cancers, chronic respiratory diseases and diabetes. Dr. Sanjit representing Sunny Medical clinic observed that non-communicable conditions account for nearly two-thirds of deaths globally, worse than HIV/AIDS, malaria, tuberculosis and all other infectious diseases combined. Whereas there are numerous programs created to address the infectious disease, the same is not replicated with chronic diseases since these diseases are associated with choices an individual makes at an early stage of life. Dr. Sanjit further explained that chronic diseases have become principal causes of suffering, disability, and death accounting for most health care expenditures. To collaborate this observation, the World Health Report (2014) states that non communicable disease are responsible for 65 % of total fatalities in the UAE where the likelihood of dying from cancer, diabetes, cardiovascular disease or chronic respiratory disease in UAE’s is likely to increase from a previous 16 % to 19 percent. The biggest contributor to this increase are younger people aged 30 years and below. Among the high risk factors contributing to this increase include high blood pressure, tobacco smoking and secondhand smoke exposure, high body mass index, physical inactivity, diets low in fruits and vegetables. Choices made usually at an early stage, for example, in the eating habits and active participation in physical activities become habits that define lifestyles of individuals when they become adults. Promoting and educating the young population (15-35 years) about a healthy lifestyle is critical in curtailing the runaway pandemics. Millions of deaths can be prevented and economic losses reduced by billions of dollars if added focus is put on prevention. It is hoped and envisaged that information learned and processed, at group levels, will be shared and spread among a wider audience and the greater community to the benefit of all. This health and wellness event is an initiative of SUC as part of the university’s CSR activities. SUC Assistant Professor Dr. Wilson Gachiri spearheaded the event.